On my question What does “TTY” stand for? It two (Now Three) close votes even worse than a down vote! I am very sad! Why whould anyone that is nice close it? There are samlier questions to it. For example 1 2 and fannly3 but there are many more! Three people have voted "Off-topic: This is not about Ubuntu". Perhaps they think it's too generic but I honestly don't have a problem with it. TTY is a term we use all over Ask Ubuntu. It's a term used throughout the official documentation. It's something used in Ubuntu. Why the hell wouldn't that be on-topic here? Yes, it's also on-topic elsewhere but so what? My Answer is not my opinion, it's just answer. 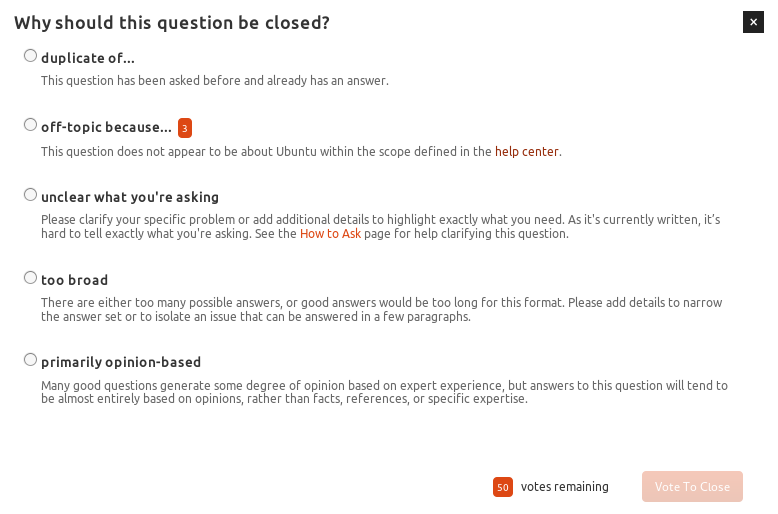 Generally in Ask Ubuntu, The questions should flow about Ubuntu related issues. So if your Question stands for even 1% Ubuntu related then you can ask here. Mention the version of Ubuntu OS you are trying/dealing with this issue. Next, Votes : See somebody may like your question so UPVOTE and somebody may not so DOWNVOTE. Its up to them. And you absolutely have a right to ask them an explanation about DOWNVOTE. If they are the real dealers then they will give explanation. If you feel something onto you and your questions, then raise a flag to moderator. They will take care.